Between 65 million and 250 million years ago, the ammonites ruled the seas. These mollusks, which belonged to the class of cephalopods, were very abundant the world over, until they took their leave and slipped into extinction at the end of the Cretaceous period along with the dinosaurs. During their reign, however, they showed an amazing ability to adapt and evolve to maintain their worldly presence. Indeed, even after death and extinction, they have managed to leave their mark in the form of one of the world’s most prevalent and well-preserved varieties of fossil. Though no one alive today will have seen a living ammonite, one could imagine that it resembled modern day cephalopods such as squid or cuttlefish, except that it lived in a shell, like the modern day nautilus. Its shell was composed of aragonite (a substance which makes up the composition of modern day mollusk shells too) and was divided into separate chambers. As the creature grew, new chambers were added, the living organism inhabiting the newest outer chamber. By filling its chambers with a mixture of water and gases the ammonite was able to swim at varying depths. Similar to all other present day cephalopods it was most likely a predator that hunted fish and other sea dwellers, propelling itself in hot pursuit of its prey by squirting water through a tube and grasping its victim with its tentacles and powerful jaws. Ammonites ranged in size from 1 cm to more than 1 metre in diameter. In the close to 200 million years that the ammonites lived on Earth, they showed a remarkable ability to adapt and evolve into countless genera and species, evidenced by the huge variety of shapes and forms of their fossil remnants. Species would evolve and die off relatively quickly (within a few million years) as newly evolved forms superseded them. At least two catastrophic events, which caused mass extinctions on Earth, hit the ammonites hard and reduced their populations, but they would soon recover and return to their teeming numbers. Finally, at the end of the Cretaceous era, every species of the genus was wiped out, and the ammonites became extinct. It is remarkable to consider that the right mix of very specific conditions have resulted in the preservation of once living creatures in their original form, many millions of years after they died. It would have started with a freshly dead ammonite sinking and settling on the sea floor. Scavengers would have consumed the soft tissue, leaving an empty shell. Silt and sand buried the shell, protecting it from weathering and erosion by the sea. In this low oxygen environment the process of decomposition will have been slowed considerably. Over time, water rich in minerals seeped through the layers of sediment, bringing very fine granules of mineral in contact with the gradually decaying shell. As these fine granules built up and fused around the shell, they gradually replaced the decaying organic matter, eventually leaving a mineral replica of the original shell. Earth movements, falling sea levels and erosion have led to the eventual exposure of ammonite fossil deposits. In different locations worldwide, ammonite fossils have formed from different minerals such as Silica, iron, calcite and also pyrite. Often, the hollow internal cavities will be encrusted in fine crystals known as druzy. In the vicinity of Simbirsk, Russia, simbircite ammonites display combinations of pyrite, calcite and silica in a single specimen. Ammonites that are preserved in clay usually display their original mother of pearlcoating intact. Others will be characterized by patterns of fine lines known as suture lines that can be used to identify different species. In some cases the suture lines are very elaborate. In Canada and the USA, ammonite fossils have been found with a surface displaying a most striking iridescence, similar to opal. 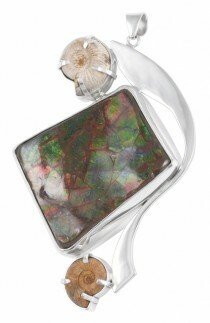 This surface material is known as ammolite. Somehow, geological conditions prevented the aragonite content of the ammonite shell from being replaced by calcite. Aragonite consists of many layers of platelets known as lamellae. When light hits the lamellae it produces an iridescent sheen, as one sees on pearl, abalone and other mollusk shells. In the case of ammolite, the fossilization process has left traces of minerals embedded between the lamellae that actually diffract light and have somehow exaggerated the magnificent iridescence. Intense colours of the full spectrum flash across the fossil’s surface. Having enjoyed such a widespread distribution in life, ammonite fossils have surfaced all around the world and have worked their way into the folklore of cultures far and wide. The early British referred to them as snakestones, believing them to be beheaded, coiled snakes. According to legend in Whitby, England, St Hilda (614-680 AD) beheaded all the snakes in the region and turned them to stone. Relics of ammonites with carved snakeheads have been found. The ancient Greeks were quite taken by their resemblance to the coiled ram horns of the god Ammon (Zeus) and thus considered them sacred, calling them Cornu Ammonis, the “horns of Ammon”. It is from this association that the name “ammonite” was derived. They also believed that ammonites provided protection from snakebite, cured blindness and increased fertility and virility. The Romans used pyritized ammonites to predict the future. They also believed that placing them under ones pillow would produce sweet dreams. The Australian Aboriginals often carried them as magical amulets. In parts of North America, certain Indian tribes considered them as an omen of good fortune. The Blackfoot Indians referred to them as buffalo stones and used them in ceremonies preceding the hunting season. Ammonites carry in them a connection to the past and a strong sense of stability in the present. It is said that working with them may help to reveal past life and karmic issues whilst fostering the stability and calmness to work through those issues. Structure seems to be the mantra of ammonite. The superb geometric structure and durability of its multi-chambered spiral shell underscore the properties attributed to it. It is said to be stimulating for those in the fields of architecture and construction. It is also said to facilitate structure in ones life. Like the slow, even spiral from its centre outwards, the ammonite engenders a sense of calm stability and form, a clear path to travel toward ones goals. It is also said to sharpen the instincts, including ones survival instincts. Again, given the ammonites’ remarkable ability to adapt and evolve against the odds for nearly 200 million years and then for their fossils to cheat decay for millions more, it is easy to see why the ammonite personifies survival. For one facing a treacherous challenge, pyrite ammonite embodies this attribute combined with the protective, shielding qualities of pyrite. Ammolite is considered a powerful luck stone that engenders prosperity and positivity, and is even said to facilitate miracles. The colours are produced by the diffraction of light, meaning that light actually changes frequency in contact with ammolite. It is highly regarded by practitioners of feng shui, who believe that it promotes the free movement of chi energy through the body and is thus excellent for health. Also placed in one’s environment, it can accomplish many benefits, depending on the colour displayed. 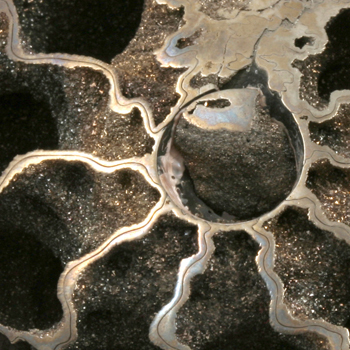 Pyritized ammonite embodies all the qualities of ammonite and pyrite combined. 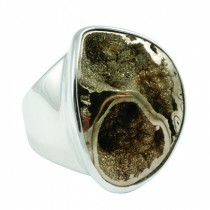 Ammonite is also said to assist in the birthing process and to alleviate depression. It has apparently been used to treat disorders of the lungs and limbs. Ammonite corresponds to Aquarius and vibrates to the number 9.